Super Hero Boy: Energon me! Transformers, only one of my absolute favorite cartoons of all time is not really one cartoon but over the years it has seen many different remakes. Energon is one of the more recent series spawned by Transformers and it originally aired in 2004. It picks up where the previous series Armada left off after the destruction of Unicron 10 years before. The beginning of the season is a bit confusing as both the Autobots and Decepticons are working together to rebuild Cybertron which was previously destroyed. This whole concept seems odd to me but don't worry its short lived. Another strange twist is in Energon the transformers can connect together to make bigger transformers... remind you of anything? *cough* Voltron *cough*. Heh. Some familiar faces are still there, others not, others reappear later. Optimus Prime is still around but Megatron is gone, however Megatron shows his ugly face later on. A little now you see it now you don't routine but it is nice to see familiar faces in a series airing so many years after the original. 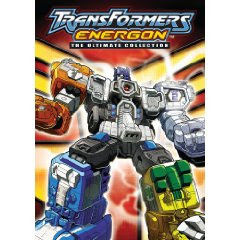 52 episodes and seven dvds in all I can't say I've honestly seen them all yet as this will keep me busy practically all winter but Transformers Energon : The Ultimate Collection is the perfect gift solution as seven dvds will keep the kids busy for quite some time. Fans of the original series will also like seeing their favorite characters slightly reinvented. I'm currently about five episodes in and thus far I'm actually pleased with the animation and the character building. Ironically the fifth episode is where you learn Megatron is still possibly alive. So I'm anxious to see what happens next as I know he comes back but how? Ironically this sounds wrong, but Energon reminds me of one story Connor's dad told me. They had a Voltron toy growing up and after their "battles" they would disconnect the cats and throw them at each other. Though I love the building bigger bots from smaller bots I really hope Connor never reads this post. Shh guys never give your kids that idea.. but can you imagine? Heh. Transformers Energon : The Ultimate Collection is available right now on Amazon! I have three copies of Transformers Energon : The Ultimate Collection to give away to our readers! Leave a comment on this post. Check out Transformers Energon : The Ultimate Collection and tell me who is your favorite Transformer!! Oh, it's gotta be Optimus Prime. Bumblebee! I didn't learn about transformers until I bought my first car... A beat-up old canary yellow beetle. Guys would come and fuss over my car and I'd have no idea why. It was my boyfriend who finally introduced me to the series, and ever since then I've been a fan. I'd love to share this one with my nephew. Optimus Prime is the best. I will listen to him. Thank you! My sons favorite is Bumblebee. Thanks! Bumble Bee will always be my favorite Transformer. Optimus Prime ~ I loved him more than my barbies when I was a wee one. My son is a Transformers fan. My favorite is Bumblebee. BumbleBee is my favorite. That car is sweet. I asked my grandson while we checked out the link and he said Optimus Prime. He said he also likes Jazz? or maybe Jas? optimius prime is the best!! My favorite is Optimus Prime but my son loves Bumblebee. Thank you! My kids would say BUMBLEBEE! Bumblebee! Love that black & yellow comination of colors! My sons favorite transformer is definitely Optimus Prime. Bumblebee is my favorite. I still have the action figure from the original series. My favorite would be Star Scream. Thanks for the chance. My son's fav is Optimus prime. My son LOVES Optimus Prime!! I asked my son....I'm trying to win this for him....and he said the best transformer is Optimus Prime. Thanks for the great giveaway. I wanted to get this set for my son so bad but wasn't able to afford it for Christmas...it would be awesome to win! He loves Bumblebee..but I am big fan of Optimus Prime ever since I was little and playing Transformers with my brothers! My favorite Transformer is and always will be Optimus Prime. Autobots... roll out! Thanks for the great give-away. kolby and billys fav is Bumblebee.they love him..
enter me please and happy new year! The mighty Megatron is our favorite. My son's favorite Transformer is Bumblebee. My favorite as a child myself was Optimus Prime. Thanks for the contest! My favorite transformer is Megatron. Ok, I don't have a favorite, but my son ADORES Bumblebee! i think my nephew likes Optimus Prime - i'm not really familiar with the names of transformers! Oh Starscream for sure. Or possibly Blackout. My favorite is Megatron, enter me please. My son says Optimus Prime. Optimus Prime, the ultimate hero leader. Please accept my entry. Thank you. My favorite is definitely Bumblebee! My nephew would love me forever, if I win this for him. His favorite is Star Scream. I have to agree with everyone else, optimus prime! my kids love optimus prime (of course!) but my fave is bumblebee. thanks for the great giveaway! I love Megatron- hard to admit! LOL! Most definetely Optimus Prime is our favorite. My favorite is Bumblebee, but I really love them all and have quite a collection. Autobots: Bumblebee! He's always been my favorite. My son just took the time to explain to me about atuobots and decepticons and all of this extremely important stuff that I should apparently have already known. My favorite is Bumble Bee since I am absolutely sure that he is a good guy. We are big Bumblebee fans here. I loved soundwave when I was kid! I like Bumblebee and Optimus Prime! Glad to ask my son on this question because frankly, I had no clue. His answer is: Starscream. Had to ask my son on this question because frankly, I had no clue. His answer is: Starscream. I am 100% sure that Optimus Prime is my favorite. Thanks for the contest! I like Bumblebee but not as much as my nephew. He loves him so much that he has been begging to name his soon to be born baby brother, Bumblebee. For some strange reason my sister said "No". My son's fav. is megatron. Thanks for the chance to win. I had to ask the resident expert (my 7 year old) he says Bumblebee! My nephew loves Bumblebee! I just recently saw the movie and I have to agree with him! I don't have a favorite Transformer as I'm too old for cartoons. However, my son loves Optimus Prime. Optimus Prime is the one my son knows! without a doubt it would be optimus prime. I like bumblebee (who doesnt love a yellow vette that can transform into a 69 camaro? Grimlock is my old-school Transformers favorite! While I like optimus prime in later years bumblebee has become my fave. My kids are huge Optimus Prime and BumbleBee fans! Thanks for the great contest, please enter me!